Another potential snag for electric car owners in a hurry, as Auto Express reports. Electric vehicle owners may not be able to rapidly charge their car at home at the same time as boiling a kettle, National Grid has warned. The grid operator said that using a fast charger, which can be installed at home to reduce charging times, is likely to trip a house’s main fuse if used simultaneously with other ‘high demand’ items such as kettles, ovens and immersion heaters. The average household has a main fuse of 60 to 80 amps and an above-average sized 11kW EV charger requires 48 amps, so adding a small number of 13A appliances risks exceeding the limit, according to the company. In a report on the challenges to increasing the uptake of electric cars in the UK, National Grid said household electricity capability is a ‘pinch point’ for motorists who want to charge their electric car fully at home. It added that compromises may need to be made between the speed of home charging and the capacity of household electricity supplies. So the “approved solution” is 2 electric cars? (The second car to boil the kettle while the first charges). Or is that why the EU wants to lower the power ratings of household appliances? Call me a cynical old bathplug, but I fully expect that the tiny few who own EVs will soon be demanding a taxpayer subsidy to upgrade their home mains supply (e.g. 3 phase instead of single phase) so they can help ‘save the planet’. You can also buy a smaller charger. Most of the time, the car sits doing nothing for long periods of time. No need to go fast. If you have a 40kW supply to your home and then draw 50kW you will either blow your main supply fuse or set the place on fire! If you have a smart meter the company will probably write to you and tell you! 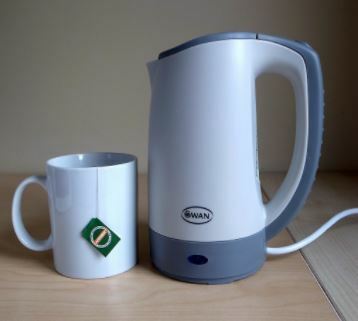 The EU suggested lowering the Wattage of the kettle to eliminate the 8 am surge but the UK did not like this as it would take at least 30 seconds longer to boil! you could always boil the water on the gas hop. Fortunately we e still have Dinorwig fully operational so at present it’s not a problem but still don’t charge your car at 8:00 am. People may need to charge two cars a night which would potentially take all evening and night to charge on a lesser supply. The idea behind charging at night is that you don’t use extra energy during peak demand. So 10pm to 6am, about 8 hrs. Ok, most of the time both cars may not need a full charge but some of the time they will. At the same time the government expects us to go over to electric heating. A: If the fuse can be swapped straight out for a larger fuse then at present it is a non-chargeable activity. However, if we need to excavate a hole, cut the cable and reinstate the fuse, costs could start at £1,100 plus VAT. Plan ahead and get an early application in to us, as this is chargeable work and could run to thousands of pounds. Or forget about fast-charging if you can’t afford the upgrade – have a hot drink instead. Also, don’t forget, we won’t be allowed heating oil or gas in the great green dystopia to come, so will need even more electricity to replace that. Still, I’m sure that our leaders have plans well in hand for this enormous expansion of our electricity system, and that it will all proceed with the customary Government efficiency. The warning was issued by the National Grid, not the media. has a 90 kWh battery, from the 25% full state. is happy to trickle feed it each and every night. costs of the chargepoint and associated installation costs. Then there’s the £thousands in grants to buy an EV and more £thousands in lost fuel duty. Guess who’s paying for all this. Here in the US many/most families have more than one car (if we’re really talking about going electric). I haven’t read anything about the impact of having more than one EV. Sat there in the silent darkness of your cold, gadget filled, eco-apartment, fearing the outer cladding might burst into flames as you attempting to warm a pot of ‘real coffee©’ with a candle. All because the politically correct, virtue signaling, eco vehicle is on a charge for the next 2 to 6 hours (Smart Meter permitting). You wonder when will this torment end, and when can you get back to watching ‘Bigger Brother’ on the 52 inch eco-friendly wall screen. I’ve still seen no solution to the problem of drivers who have to park in the street, a majority I suspect in many countries including the UK. An obstacle course of heavy cables stretched across pavements (assuming a car is even close enough to the owner’s home) or vast expenditure on charging points every car-length in every city and village in the country? The ratio of can to can’t (charge at home) is somewhere near 50:50. When are people going to notice that electric cars would/will limit them to travelling short distances from home? I have to disagree and suggest that the real pinch point will be the local LV distribution network. This is the 230v cables in the road. A vast percentage of it being extremely dated paper insulated stuff. When it was installed the calculations were for less than 1kW on average per dwelling. Ratings for cables are thermal with a long time lag if buried in the ground so its OK taking much more than average while cooking your dinner if you take much less than average while sleeping. Unfortunately there are many instances where these old cables are having to be replaced now as they are overloaded and are breaking down due to our average consumption creeping up somewhat. Near to where I live they did a major new cable install near the town centre and had to close roads off for over 6 weeks. If you now add significant overnight EV charging to the LV network it will be massively overloaded. Any solution to cope such as more cables or more 11kV/415V substations is hugely expensive. This has not been properly thought out.